Valentine’s Day: a holiday that strikes fear into the hearts of many men, makes greeting card company CEOs rub their hands together with glee and results in florists collapsing from exhaustion by noon. Romantically inclined folks love it. Singletons and the soon-to-be-divorced hate it. At Signs.com, we don’t have an official opinion. But we do know this: we love signs about love. The design for this sign was created in 1964 as a Christmas card for the Museum of Modern Art. 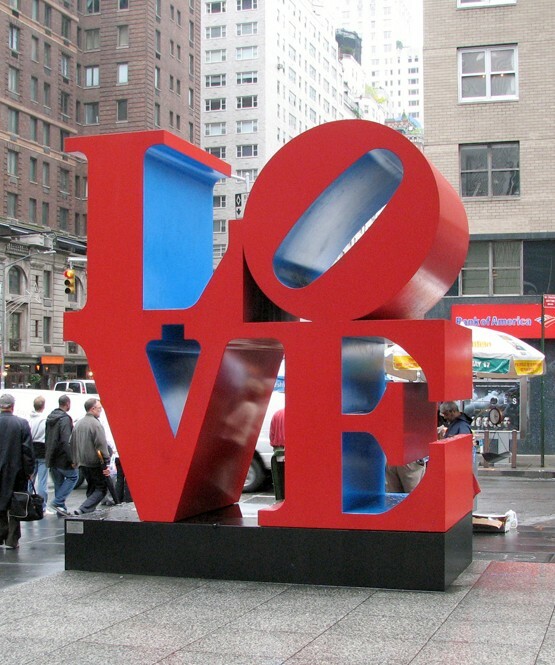 The New York artist, Robert Indiana, was well-known for his pop-art and sculpture. The LOVE image was featured on a U.S. Postage stamp in 1973. The sculpture is made of steel; versions of it can be found all over the world. This sign is located in New York City on 6th Avenue and 55th Street. This sign is a lot less polished than Robert Indiana’s LOVE sign, but in some ways, it has even more charm. 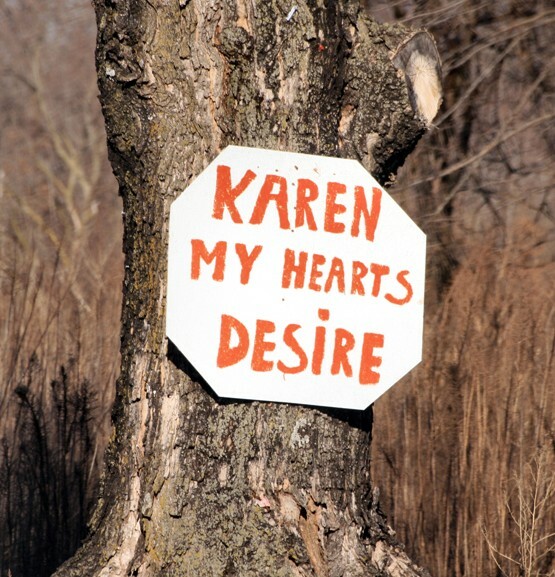 And we’re impressed that the creator of the sign didn’t break out the pocket knife and carve a heart into the bark, which damages the poor tree and scars it for life. While we would normally be critical of the missing apostrophe, we’ll give Karen’s lover a pass on the lack of punctuation and messy handwriting. Karen’s a lucky girl. 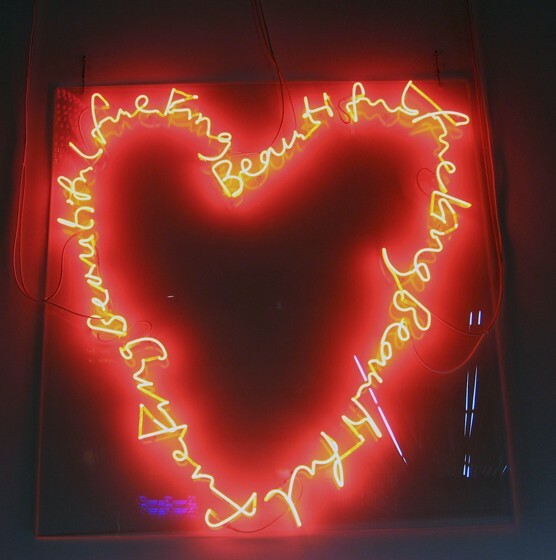 What could be better than love in neon? It’s a beautiful feeling, we agree. A Frenchman name Jean Picard discovered the glow of mercury way back in 1675. Everyone knows that the French are famous for their skill in the ways of love and courtship… therefore, neon must be romantic. It’s a logical conclusion. This sign is a glowing sentiment to the feeling of love. Until you unplug it. Then it’s just a mish-mash of grey tubes in the rough outline of a heart. Keep the power bill current, and all is well. High school is fraught with romantic drama and Valentine’s Day seems to just add to the hype. 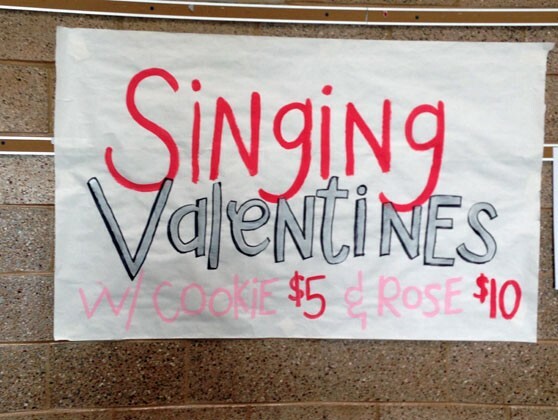 Singing Valentines are popular fundraisers, but you have to wonder how many teenagers will be upset when someone tries to move in on their sweetie with a cookie, a rose and a singing love ballad. 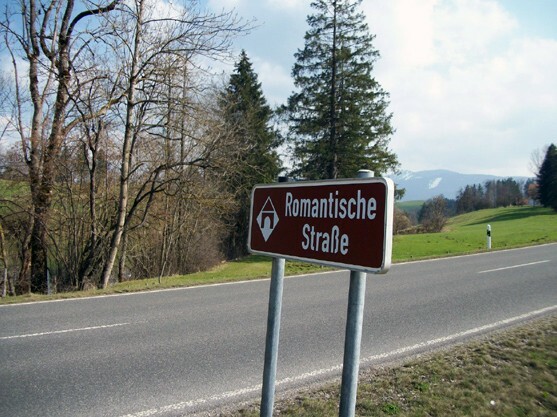 How would you like to live on Romantic Road? You’d have to relocate to Peiting, Germany, but it might be worth it just to be able to give your address (in German, undoubtedly) to people. It’s located in the Bavarian region, South of Munich. “Lieben” is German for love, in case you couldn’t tell. 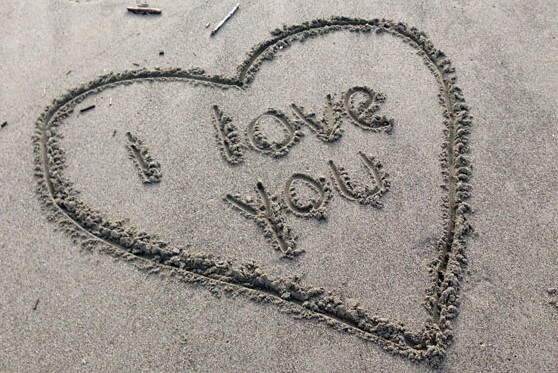 Some love signs aren’t romantic… they’re just sweet. These ladies are at the Naval Air Station North Island in San Diego, California to welcome Dad home from a six-month tour in the Persian Gulf on the USS Nimitz. Family members all over the world hold signs similar to this one as their loved ones return from military service and we can’t help but think that they’re welcome signs to soldiers and military personnel. Some signs of love are temporary. This sign surely disappeared just hours later, as the tide came in. Just because a sign is temporary, doesn’t mean that the sentiment is. Hopefully this romantic lover still feels the same way! 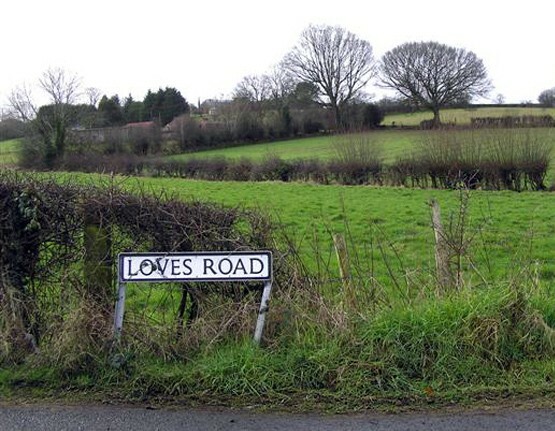 Another romantic street sign! This one is in Gracefield, an estate in County Laois, Ireland. Both the name and the sign are a bit more romantic that its German counterpart. Which place would you rather live? 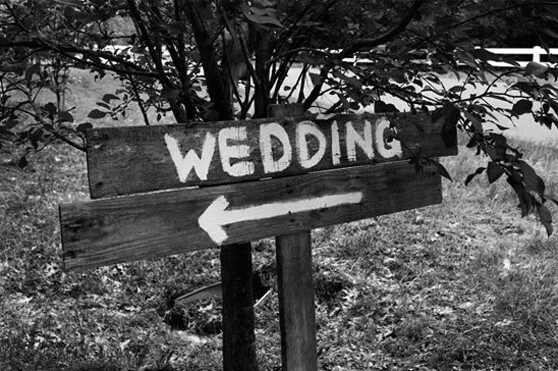 This great wayfinding sign is the perfect sign of love… and commitment. And to Dad, probably a sign that he’s going to get a hefty bill once the champagne is gone and the last guest has finished polishing off that $750 wedding cake. What could possibly be better than pizza? 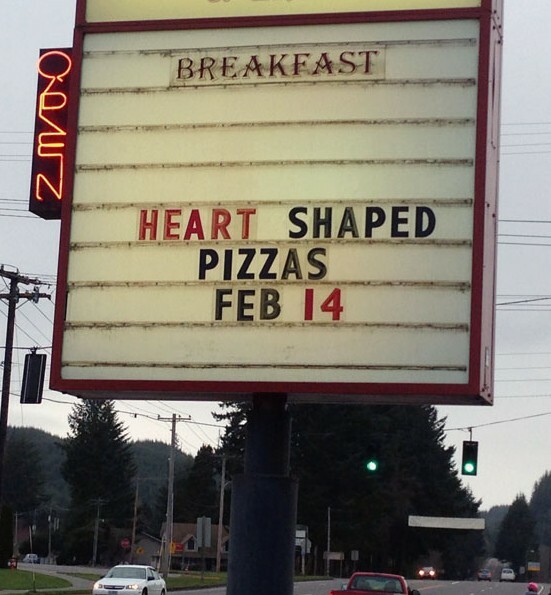 Pizza in the shape of a heart, of course. Perfect for the guy who forgot to make reservations at the nice restaurant. Grab one of these and some grocery-store roses and you might just salvage the holiday.